Roman Catholic Womenpriests: Anglican Archbishop Rowan Williams Confronts Pope Benedict-Would Jesus Confront Pope Benedict on women priests? "The Vatican says its invitation came in response to pleas from Anglicans unhappy about the imminent consecration of women bishops. Speaking after meeting the Pope, Dr Williams told Vatican Radio: 'I wanted to express some of my concerns about the way in which the announcement of the Constitution had been handled and received because clearly many Anglicans, myself included, felt thatit put us in an awkward position." Pope Benedict should have apologized to Anglican Archbishop Rowan Williams for the Vatican's lack of openness, dialogue and consultation. How would Pope Benedict feel if the Anglican Archbishop had swooped in and announced the conversion of Roman Catholics to the Anglican Church? Pope Benedict should also apologize to the world's women for the Roman Catholic Church's ongoing discrimination against women priests and women bishops. I do not understand how a church, rooted in the Gospel, can act in a manner so out of sync with Jesus' example. The Risen Christ appeared first to Mary of Magdala and called her to proclaim the Good News to the male apostles. Therefore, Mary of Magdala was chosen by Christ to be the apostle to the apostles. Why doesn' the Vatican get it? If Jesus treated women and men as equals, how can Pope Benedict justify the Roman Catholic Church's discrimination against women priest and bishops? He can't. The good news is that mainstream Catholics are embracing Roman Catholic Womenpriests as their pastors. Why? They want a church that follows Jesus' example. Ask yourself, would Jesus confront Pope Benedict for discriminating against women priests and bishops? It's a no-brainer! Read the Gospels. Study the tradition. For twelve hundred years, women were ordained deacons, priests and bishops. The real question is why is it taking the Roman Catholic Church so long to catch up with Jesus and its own tradition? Roman Catholic Womenpriests : Anglican Archbishop tells Pope: there will be no turning back on women priests"
"The Archbishop of Canterbury yesterday made his most outspoken challenge to the Roman Catholic Church since the Pope invited disaffected Anglicans to switch to Rome. Speaking before he meets Benedict XVI tomorrow, Dr Rowan Williams told a conference in Rome that the Catholic Church’s refusal to ordain women was a bar to Christian unity." Three cheers for Anglican Archbishop Rowan Williams' challenge to Pope Benedict: -women priests are here to stay! So are Roman Catholic Womenpriests here to stay! Roman Catholic Womenpriests are growing in numbers and on the move in the Roman Catholic Church. See map below indicating growth in the United States. We love our church and are working to renew it in grassroots inclusive communities where all are welcome at the table. Now wouldn't it be wonderful if more of our bishops, like Bishop Tom Gumbleton of the United States and Bishop Willie Walsh of Ireland, would advocate for women's ordination in the Roman Catholic Church. Let's pray that many bishops worldwide will take a page out of their books, and speak up as prophets for justice and equality for women in the Roman Catholic Church. After all, women are half of the population! BALTIMORE -- The leader of the Catholic hierarchy in the United States on Monday launched a new effort to rein in Catholic debates and dissidents and to remind the flock that the bishops will be the arbiters of what it means to be a Catholic. All Roman Catholics are equal members of the church by their baptism. The hierarchy does not own the "franchise" or the name, "Roman Catholic". Let us pray for a deeper awareness of teachings of Vatican 11 --that the people of God are the church. The hierarchy's role is not to dominate or control the movement of the Holy Spirit within the community, but to serve as Jesus did. We are beloved sisters and brothers. It is time for the whole Catholic family to own our identity and live our tradition. Let us be open and work together to heal the wounds of divisiveness. May we be united in prayer and loving service to God's people and follow the example of Jesus in our work for justice and equality in our world. 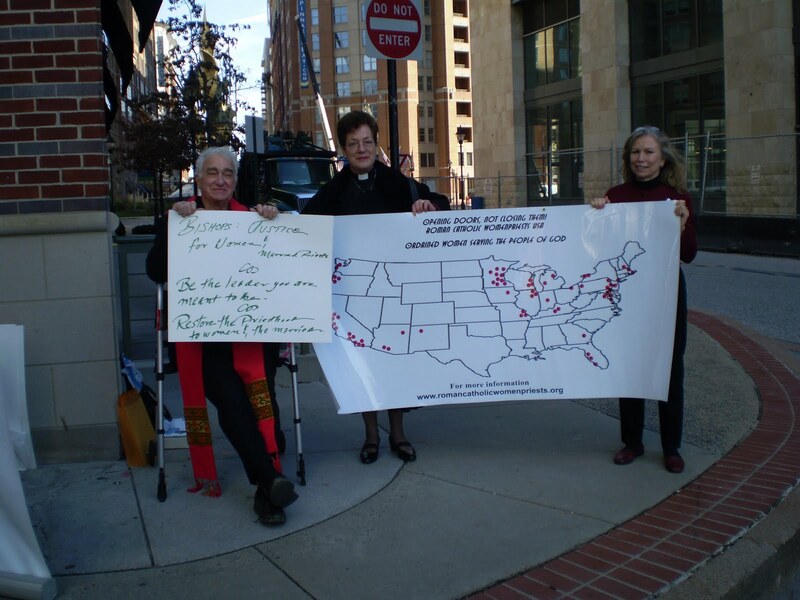 Roman Catholic Womenpriests : Map - Red dots represent locations of womenpriests in the U. S.
Roman Catholic Womenpriests and CORPUS (association of married priests) witnessed on our behalf at the recent USCCB meeting on Wednesday of this week. The red dots on the map represent all of our ordained women. our loving service to God's people. Click on picture to enlarge. If you click on the map above, you will see red dots that indicate where there are womenpriests-led communities in the United States. On Tuesday, Nov. 17, 2009 Suzanne Thiel,a Roman Catholic Womanpriest from our Western Region, distributed our Year of the Priest- Prayer for Vocations to some of the bishops who were attending the United States Catholic Bishops' meeting in Baltimore. Suzanne was able to share the prayer cards with the bishops during their lunch break.Only one bishop responded negatively. He yelled, " wait a minute!" This did not slow down Suzanne. She continued to move from table to table, smiling graciously at each bishop as she placed the vocation prayer in his hands. 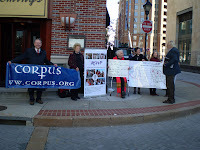 Then, on Wednesday, Nov. 18th, several representatives of Catholic renewal organizations gathered together outside the hotel including Bill Manseau, a married priest who is president of the Federation of Christian Ministries, Fred Ruof, a prominent elder and leader of justice and peace causes in the Baltimore area, Zemaya Jones, a representative from Living Waters Inclusive Catholic Community in Catonsville, Andrea Johnson, Roman Catholic Womanbishop of the Eastern region and (co-pastor with Gloria Carpeneto, rcwp of Living Waters Inclusive Catholic Comunity) and Suzanne Thiel, rcwp. 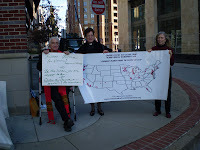 They held up banners including a map with red dots indicating the states where Roman Catholic Womenpriests serve the Catholic family in the United States. Then at lunch time, our womenpriests, accompanied by their companions, came into the hotel, took off their coats and sat at a table near the bishops. According to one report, the male bishops practiced custody of the eyes when the women took off their coats and their clerical collars became visible! 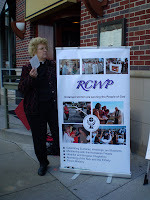 Just in case, any bishop missed out on receiving a copy of our rcwp prayer the day before, Suzanne took one final stroll through the dining area where the bishops were seated. 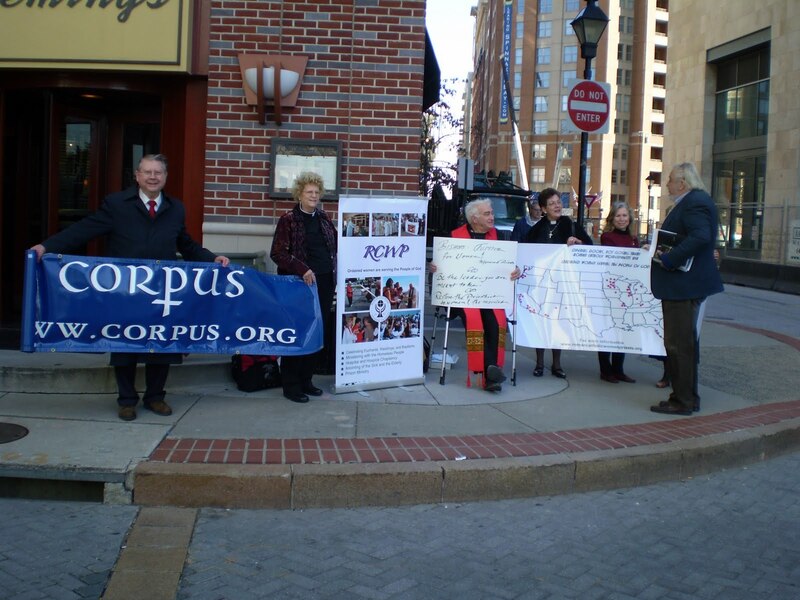 She was even able to catch the bishops as they left the hotel on their way to the airport! Unforgettable encounters! I hope our bishops will join us in the prayer for vocations and "practice the equality that Jesus modeled to embrace all women and men whom you have gifted for sacramental ministry." Ordained Women are serving the People of God. and inspire us to use the unique gifts you have given us for loving service to each other. We pray especially now, for those women whose gifts are best suited to serve your Church as ordained priests. Empower them with the courage as they answer your call and strengthen them for humble service, great compassion, and insightful wisdom. Support them through their ministries and enlighten the leadership of your Church to practice the equality that Jesus modeled to embrace all women and men whom you have gifted for sacramental service. Strengthen your Holy Spirit within those you have chosen for priestly ministry. May they answer your call and follow with generous hearts. We ask this in the name of Jesus, who called Mary Magdalene and Phoebe- as well as Peter and Paul- to be ministers in the early Christian communities. Amen.